It’s undeniable that home cinema has become a part of people’s daily life to enjoy and entertain themselves from tedious work and hard study. And Popcorn Hour media players such as A-200 has won people’s love because of its comprehensive media playback, user-friendly interface and well-built hardware and more movie fans and TV show lovers would like to invest in Popcorn Hour. While Popcorn Hour A-200 has its limitations which keep some people away, that it cannot accept Blu-ray Disc directly. As a pursuer who wants to enjoy excellent video and audio playback of Blu-ray movies on Popcorn Hour, it is necessary to rip/convert Blu-ray to Popcorn Hour A-200 acceptable video format. Here is a brief guide about how to play Blu-ray movies with Popcorn Hour A-200. Step 1. 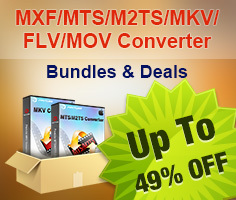 Load Blu-ray Disc to Pavtube Blu-ray to Popcorn Hour Converter. Pavtube ByteCopy includes both Windows and Mac version, so you can rip/back up Blu-ray Disc to MKV with multiple audio and subtitle tracks as well as chapter info preserved. After insert disc into Disc driver, open Pavtube ByteCopy, click “Load Disc” icon to successfully load your Blu-ray Disc within 20 seconds (much faster importing speed on second time). Step 2. Select optimized profile presets for Popcorn Hour A-200. 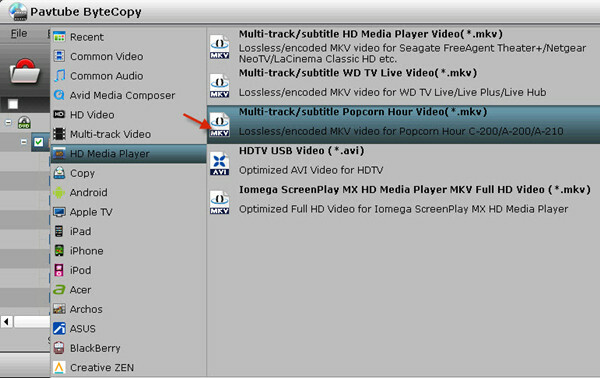 Pavtube Blu-ray to Popcorn Hour Converter specifically classified profiles into different catalog according to brand, OS, etc, and you could easily find the optimized profile for Blu-ray to Popcorn Hour A-200 conversion by following “HD Media Player > Multi-track/subtitle Popcorn Hour Video(*.mkv)”. Note: Don’t forget to encode desired Blu-ray PGS subtitles to dvdsub format since Popcorn Hour can only recognize SRT, MicroDVD SUB, SSA, SUB/IDX subtitles for display. Step 3. Start Blu-ray to Popcron Hour A-200 conversion. 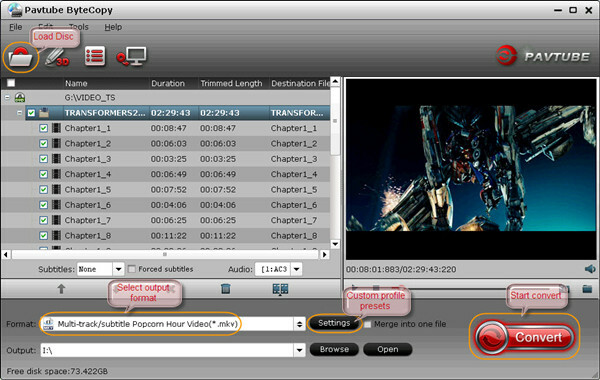 After customizing audio and subtitles, click “OK” to save your settings and return to ByteCopy interface, click “Convert” to start Blu-ray to Popcorn Hour A-200 conversion. After 30-40 minutes, you would get a complete MKV file, locate the created movie by clicking “Open” button and you are able to put Blu-ray movies on Popcorn Hour A-200 for watching.